This is a preview and not a definitive review; the sample I got is just a snapshot of a product under development. This means that features, bugs and test data can change. All you’ll get is a basic idea of what to expect. Many thanks go to K-PO, the company that sent me this sample. The radio didn’t come with a manual, so I tried to figure out the menus by trial and error. Dubbed to become the successor of the AT-5555, I wondered if some flaws were fixed, or about to be fixed. When I reviewed the Superstar 6900N, which I still own and use, I ran into a few problems. The most prominent one was the presence of unwanted mixer products up and down the carrier. CRT France, apparently very annoyed by my findings, refused to send a service manual. This ruled out the possibility of finding the cause, let alone a fix. Last flaw: 5 KHz steps are too coarse for amateur use. The AT-6666 is one of many so-called export radios. 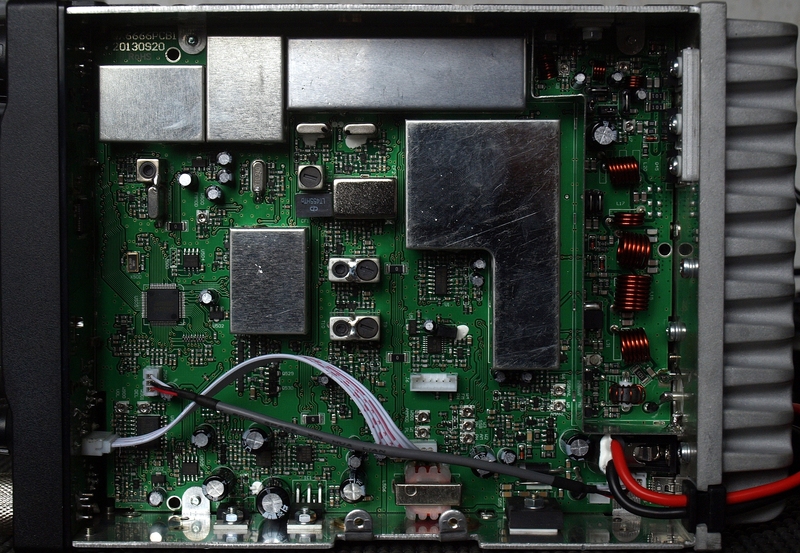 An export radio is basically a CB transceiver that can’t be sold legally in most countries. Either the power output is too high, the frequency range is too wide, or some modes aren’t allowed. In most cases all of the above applies. 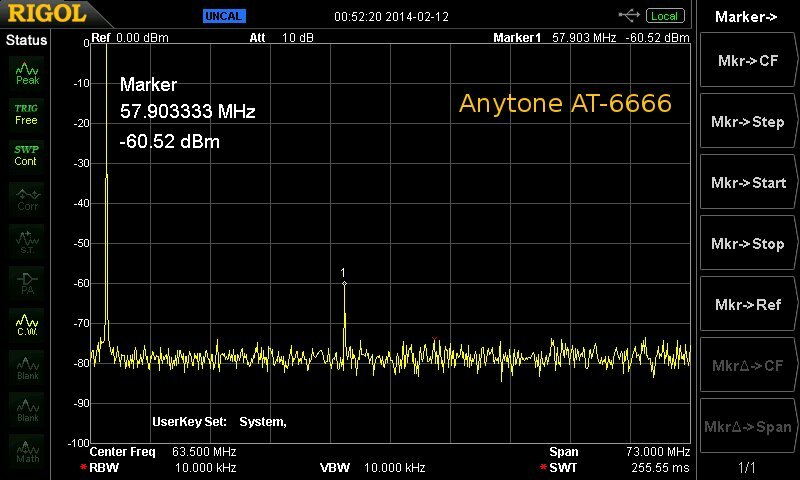 The trick some manufacturers use is to initially limit the frequency range to 28.000 – 29.700 MHz and advertise these radios as ham radio transceivers. Suddenly these radios are legal to sell, because ham radio operators may use any mode and generally don’t have to worry about power output restrictions. The catch: without exception it is very easy to modify these transceivers and change them into an (illegal) CB radio. The first thing I noticed is that this radio looks more like ham radio equipment than previous models. The ‘old’ Anytone AT-5555 and all its identical twins can be recognized as CB radios from miles away, but this model could fool you. The AT-6666 is a small radio: 24.6mm x 15.7mm x 4.8mm (depth x width x height, heat sink and knobs included). The microphone is simple but ergonomic with Up and Down buttons located on top. The LCD background color is selectable, something I like a lot. If this is a beta version, it doesn’t show. This is a nice PCB, neatly built. RF power is generated by four 13N10 Power MOS FETS (download specs here). Three are mounted at the back, one at the left. Whatever Anytone did they did right: the strange, unwanted mixer products are gone, and harmonic suppression is excellent. There’s no phase noise of any importance present, which is a sign of a stable oscillator. 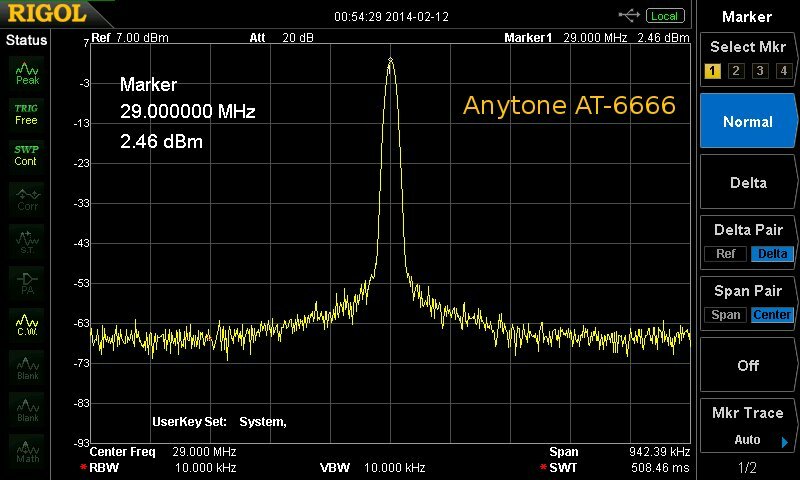 With a harmonic suppression better than 60 dBm, this Anytone joins the ranks of the best. No phase noise, no unwanted mixer products. At the highest resolution of the counter I measured a difference of +5Hz. Such a small difference is completely irrelevant. Not quite at the promised levels yet. Don’t forget that this is a preview sample. The menus are divided in two parts. One is hidden under the menu button, the other under the channel selector. The menus pop up when you press these keys for about one second. The front panel of the radio is more or less self explaining. 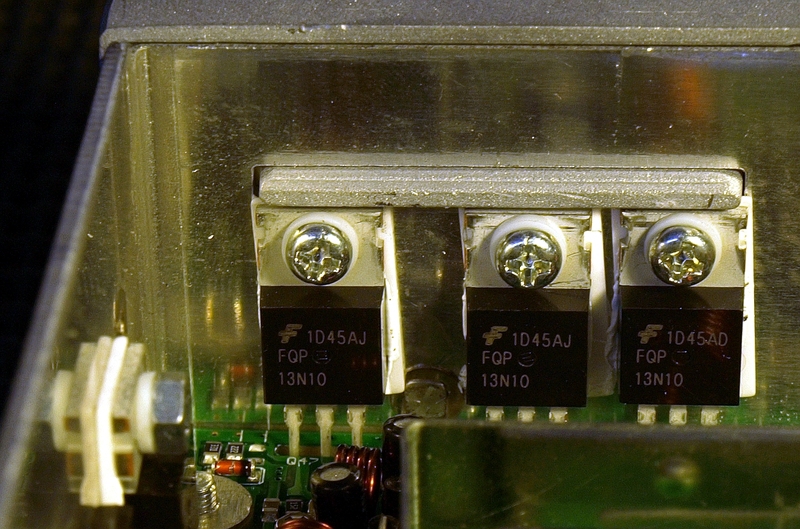 You have an on/off/volume knob and adjustable RF power, RF Gain, Clarifier and Squelch pots. At the back we find a micro USB connector, so there’s no need to open up the radio in order to program it. The first thing I noticed is that the quality of the modulation improved. The AT-5555 / Superstar isn’t bad, but a bit on the tinny side. This radio sounds more like my Yaesu FT-900. I could work what I heard, and in the end that’s all that counts. Sensitivity is fine and on par with the previous models. For a beta version there are surprisingly few flaws to be found. Almost all of my gripes were addressed; the AT-6666 is what the AT-5555 should have been, or what I hoped it would be. Still 5 KHz steps at default on 10 meters. Smaller steps can be set by pressing the channel selector momentarily, but the radio will default to 5KHz as soon as you let go. Oh well, it’s a CB radio, right? I didn’t look into all the details of the programming software, but it appeared to work as advertised. Bottom line: I like this radio. I like it a lot. So, this is a nice radio for the 10 meter band, if the price is right? Did you also tried the AM modulation (for a AM rally on 10 meter)? AM sounds good. I don’t what price is ‘right’. I hope for a price point equal to the AT-5555 (sub € 200). These are the factory specs, Randy, I just copied them. As you can see my test equipment says something else. I was just about to ask the same question! For the export market good punchy audio is important. Much more so than on the Ham bands due to the all the QRM on the “funny” channels. Extra cooling is always good because you never know where the radio will be mounted. As far as output power, well, anything below 300 Watts may as well be 12 Watts. If you need help you need a lot of help, or none. The export market has been full of radios just like the AT-666 for years. To sell more than the the other guys Anytone needs to stand out in a crowd. Go big or go home, as they say. The 6666 looks like just another export radio and I see no reason to buy one. Did it show the same spectral purity in the 27mhz range as well Hans? How hot was hot? Was this in SSB or AM/FM modes? Were the knobs and buttons easy to manipulate? Not too small? I will do these tests later and let you know. unfortunately the Dutch distributor wanted the radio back before I could do additional tests. There might be a chance that I’ll get a final production sample for a longer period of time. Is this channel based? or can you set frequency as well ? 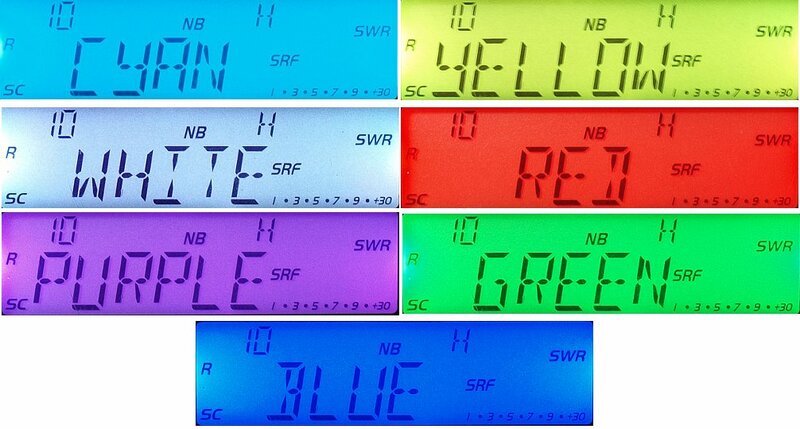 The display can show either channel numbers or frequency, but the underlying system is channel-based. And they say the hobby is dead! A problem I have with my AT5555(v6) is that with the engine not running on the car, on SSB it’s not very linear. When the car is running the transmitted audio is fine but then receive is not so good with QRM from the car and engine noise. Can you do a test in a car with engine running and engine off? If I still had a car…. sorry. Is it really “steps” or is there a vfo option with a real “vfo” ? I have a production model and it is a continuous tuning clarifier. You can set different TX/RX frequencies for a given memory position. This can only be done with the programming software, not ‘on the fly’. The radio is not for sale yet. Probably end of March. The measured Ip3 is -15dBm. so that the amplifier operates linearly. Between these films are links to other videos. I love my old (old?) 5555 – it’s engagingly low-tech, and it has the feel of a 1980s CB with a few advantages. I always get good reports on 29MHz AM and on 28.5MHz SSB. The 6666 looks interesting, though. I do hope it won’t be necessary to take the top off it to programme it for the precise channels you want! No (see picture of the back). A micro USB connector is now standard on all new models. PS. If the ‘export mode’ tunes down to 25MHz, how practical do you think it might be trying to make the rig work on 12m? I know I’m asking you for guesswork here, but you will have a better idea than I will. I don’t know Paul. I never looked into that. What’s still unclear to me: What steps are default when turning the big knob without pressing it first? 5 of 10 KHz? It does 5KHz steps in 10 meter mode, and 10 KHz steps in CB mode. WHEN WE GOING TO GET OT SOOOOOOON I HOPE. Yes, Yeta Comm in NZ has them! HI DOES THE RADIO HAVE THE ABILITY TO CHANGE THE 40 CHANELS TO 60 CHANELS PER BANK LIKE CRE 8900 VIA PC PROGRAMING. CHEERS THANKS FOR ALL THE OTHER INFO. Where can i download the software from for the Anytone AT-6666 Radio?? Hi, i did not recieve a programming cable with my AT-6666, doe the AT-5555 cable work on the AT-6666 ? doe anyone know? They are different cables … The AT-6666 look like mini-usb but I might be wrong. Programming cable of AT5555 fits direct to board on the 6666 and works without any troubles at all. No issues.. The drivers with the software work on vista, windows 7 and I use windows 8.1 and all worked fine. Recently I bought a CRT SuperStar 9900 which (I think) it is the twin brother of the AnyTone AT-6666. I’d like to ask you all about the frequency changing in this radios. I saw a big difference between the Anytone and my CRT, when I “dial” the frequency on the Dial Button (or in the microphone buttons). In the Anytone case it has no delays when changing between the frequencies. My CRT 9900 looks like it mutes when I change frequency with the microphone buttons. I have to stop presssing the up/down buttons and wait to listen because the receiving is not continuous. The same happens when working with the Dial Button. If I run it too fast, I stop hearing and have to wait a half second to have sound again. Does anybody have any idea of what can it be, or how to solve this and make it work like the Anytone AT-6666? Many thanks in advance and my best 73!